Which platforms are most relevant to social media marketing right now? Marketers need to know where (and how) they should focus their efforts for maximum ROI. This article gives you four major research findings from reports tracking trends in social media marketing and the content that works best on each. It’s impossible to miss the powerful effect of visual content on the social web. It can significantly enhance a brand’s marketing objectives by generating more customer interest and prompting prospects to take desired actions. As an example of the power of pictures, consider that Tumblr, Pinterest and Instagram each gained over 10 million visitors in 2012, thanks to eye-catching content. Numbers from Statista numbers shared on Mediabistro show that users spend more time on Pinterest (1:17 minutes) or Tumblr (1:38 minutes) than on Twitter, LinkedIn, MySpace and Google+ combined. 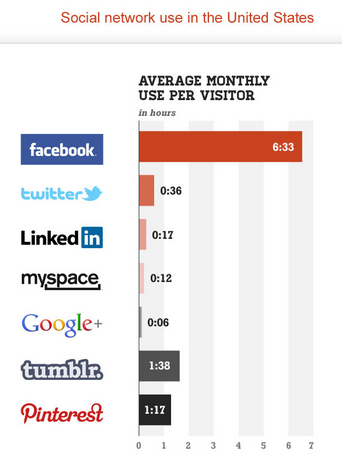 Visual social networks get more time from users than non-visual networks. You can also leverage real-time photo sharing. Customers and followers are used to seeing staged photos that highlight your products and the best parts of your company. Sharing impromptu pictures can be equally compelling when shared in real time. When you do post product or brand pictures on networks like Pinterest, Instagram and Flickr, allow others to use your images in exchange for a link back to your site. Don’t forget video! YouTube is the second-largest search engine (after Google, which coincidentally owns YouTube). Videos uploaded to YouTube do very well in searchand boost your site’s ranking. Interviews, Q&As, product demos or tips are popular with a wide audience beyond your current followers. Even if you don’t sell tangible products, your brand can still leverage visual content by using memes. Finally, don’t give up on memes, which are especially popular on Tumblr. For the best success with memes, make sure they’re witty and match your brand and audience. NPR did this particularly well by modifying the popular Ryan Gosling Hey Girl meme on their Tumblr page. Google+ is finding success with social marketers more as an SEO option than a marketing tactic. 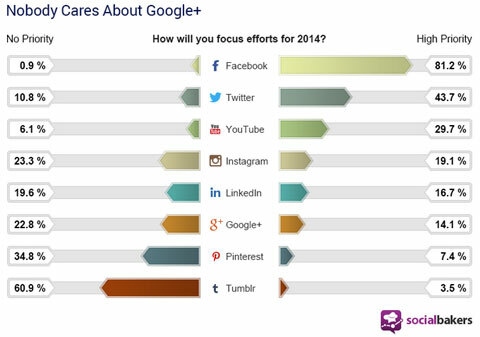 While it’s doing better than Pinterest and Tumblr, only 14% of marketers are giving high priority to Google+ in 2014. 23% of those surveyed won’t consider the platform at all. You should still have a presence on Google+, even if you’re only using it for SEO. Google+ is widely seen as an SEO tool, rather than a compelling social network. As you cultivate your presence on Google+, the first thing you should do is optimize your Google author profile with a great image. With an eye-catching photo, it won’t matter if you rank third or fourth on the search engine results page. Your image is what gets people’s attention and lends to your authority. When you post an article on Google+, choose your first sentence carefully and use keywords or phrases. That sentence is part of the title tag and can affect your search ranking. As a bonus, one of the great things about Google+ is that you canedit your title and posts anytime. If you find your post isn’t getting the traction you want, try a new title and lead sentence. That’s a lot of control right there! As always, continue to publish great content on your blog and Google+. While you’re at it, go ahead and +1 your own content. Why not? Google already knows you’re the author anyway. At the very least, it encourages others to +1 your post as well! In January 2014, Facebook updated their news feed algorithm to deliver more relevant content to users. Status updates from pages are no longer treated the same as text updates from users’ friends, because most users interacted with friends, not pages. What does this mean for you as a marketer? You have to mix it up. Since users may not see or engage with your page updates often, make your posts as interesting as you can. Include photos, videos, links (don’t forget to include a preview image), questions, events and offers. Use interesting and fun updates to encourage your fans to engage with you. Image source: iStockPhoto.com. In all cases, use the story type that best fits with the message you want to tell. One more thing: If you use Facebook’s Promote feature and your post has an image, that image can’t have more than 20% text. Sixty-two percent of B2B marketers say LinkedIn is the most effective platform for them, with Twitter and SlideShare close behind. 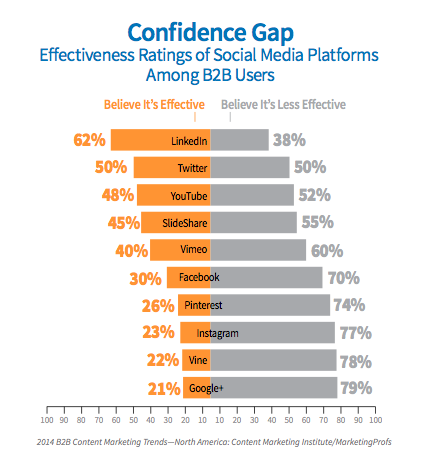 LinkedIn is the most popular social network for B2B. How can you take advantage of the most effective social media network? Take advantage of LinkedIn’s publishing platform. LinkedIn opened up its publishing platform (previously reserved for a few editorially selected influencers like Bill Gates, Martha Stewart and Joe Pulizzi) to all 277 million LinkedIn members. This could be a game-changer. If you decide to publish on LinkedIn, know that posts with the same basic information found on 50 other blogs won’t be successful. LinkedIn users look for well-written personalized insights, professional expertise and interesting industry opinions. Surveys are helpful to gauge trends in social media; however, it’s even more important to track your own successes and build on them. You can use both options by keeping trends in mind and using them as guides as your marketing strategy and tactics evolve.